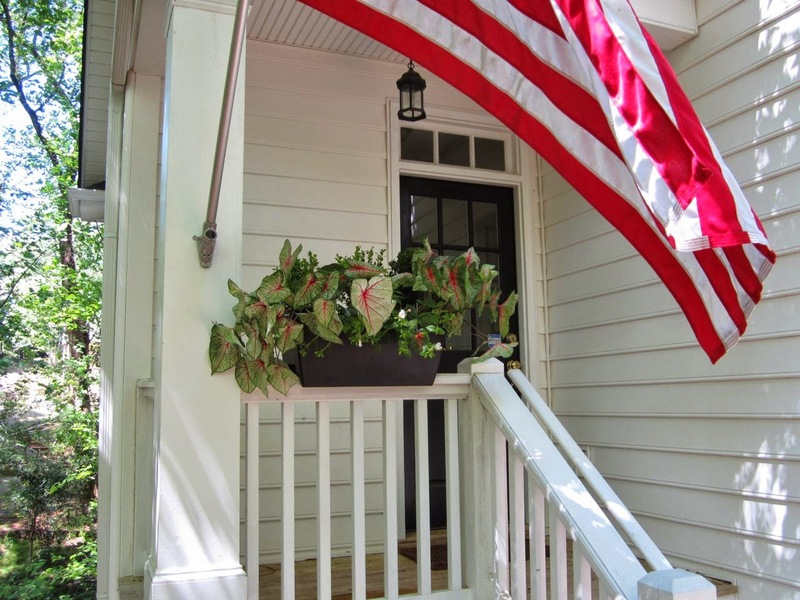 The Mister threw down the gauntlet this past weekend: Create a flower box for our tiny and underwhelming side porch. I willingly accepted his challenge. 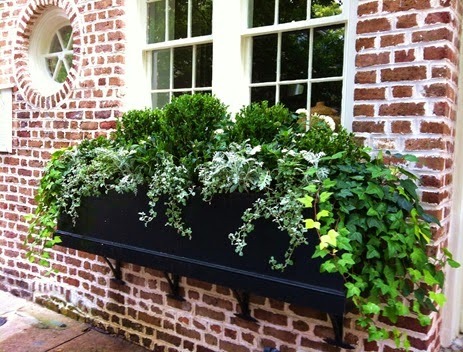 I knew I'd draw my inspiration from the amazing flower boxes and container plantings I'd seen in Charleston a few years ago and several times this past year as well. We headed to Lowe's where we found a suitable container that would fit over the porch rail. We agreed that because our house is quite shaded and we weren't sure of flower box success, we didn't want to spend a lot on something custom. Thankfully, we found a rectangular box that looks as if it's been painted flat black. It's actually molded plastic, of course, but my hope is that once plants are trailing over the sides, no one will notice its plasticity. We also purchased three miniature boxwoods as I knew that's what I wanted as the foundation planting of the box. The next morning I headed to a locally owned nursery to see what was available for shade plantings. Quite a bit, actually. 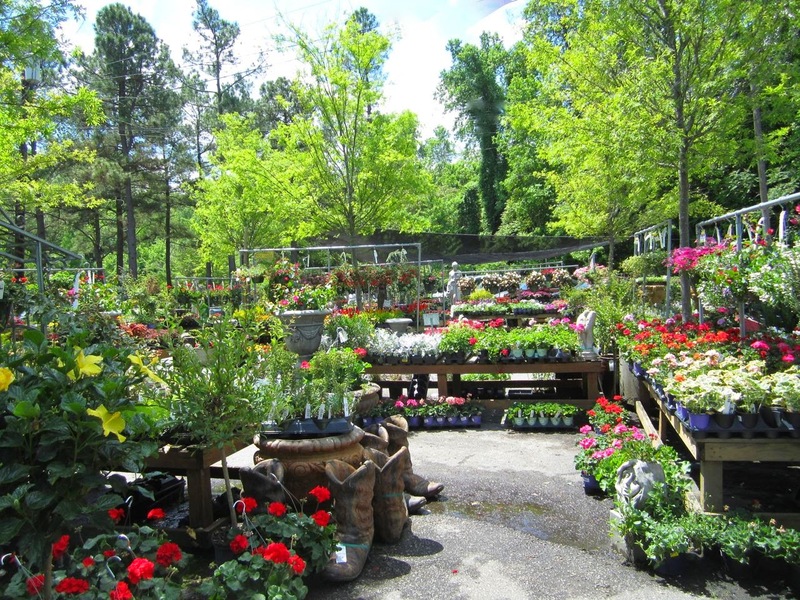 Although I longed to wander all eight acres of shrubs, trees, water garden features, and perennial plants, I tried to stay in the annuals department. So many colors tempted me, but I decided to keep it pretty simple with green, white, and the smallest bits of deep, bluish pink. 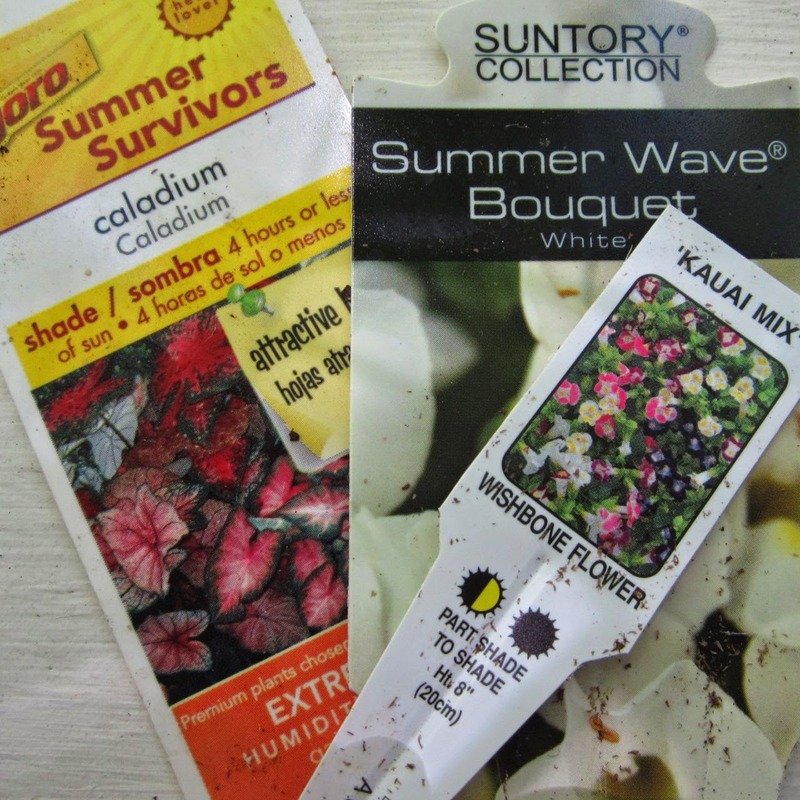 I ended up with boxwoods, caladiums, purplish wishbone flower, and white torenia, all recommended for shade or part shade. I kept in mind the recommendation to choose a filler (boxwood and wishbone flower), a thriller (caladium), and a spiller (torenia). My total spent on plants was about $40. 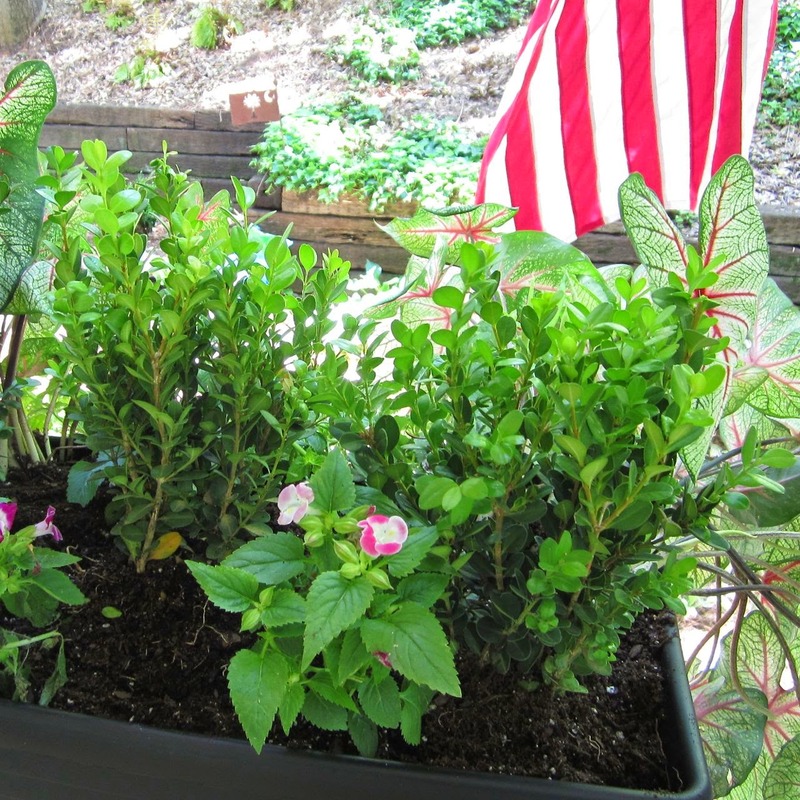 First, of course, I filled the container with potting soil and then placed the boxwoods in the center toward the back. 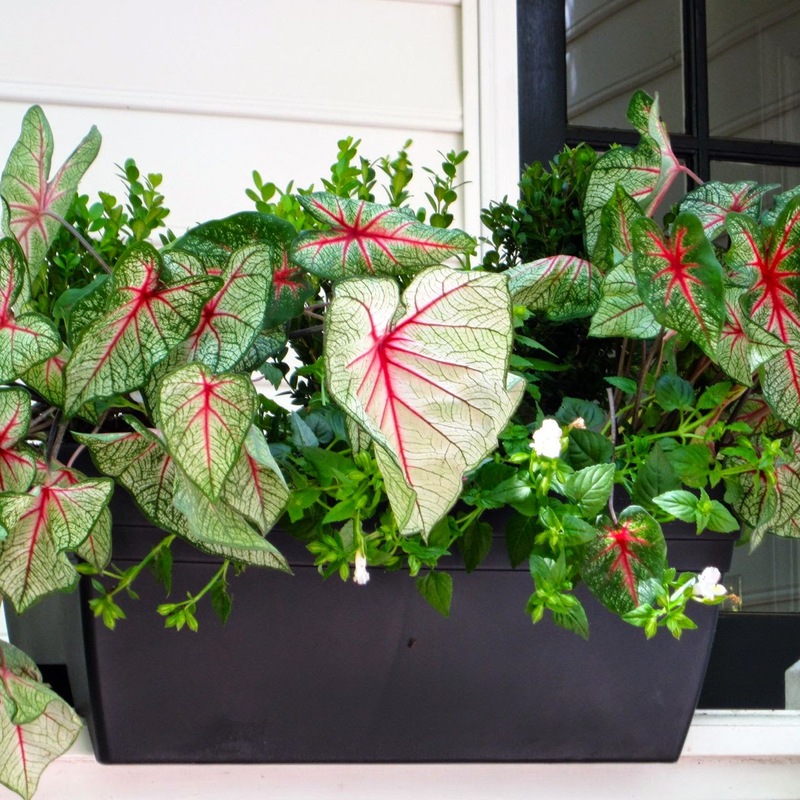 Then, the caladiums, which I kind of angled slightly, so they would spill over the edge of the box. 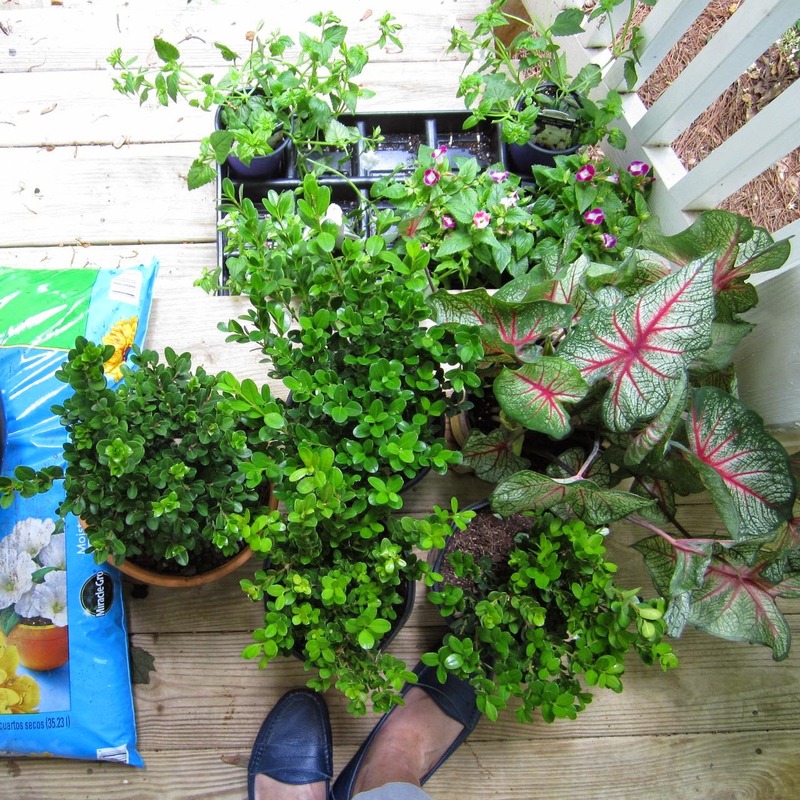 Then, I stuffed in the smaller plants, making sure to cover their roots with potting soil. The Mister drilled holes in the bottom of the flower box so that the plants could drain easily. I am hopeful that it won't take long for the torenia and the wishbone flower to grow and trail and spill over the front. Although it was fun, making a Charleston-style flower box was harder than I'd thought, and I welcome any tips or advice on making it look a bit more posh. Maybe some ivy? Or do I just need to be patient?! NOT going to work TOO well.........in my opinion.For the cascading effect try BACOPA.........a white flower. Try to keep it to one color or two.............you do not get the WOW FACTOR with multiple colors. I too LOVED CHARLESTON!GOOD LUCK and I could be totally wrong! Thanks La Contessa. I will have to check out Bacopa, I don't remember seeing it around here. I'm counting on the boxwoods being slow b/c I want them in there for a long time as background for other seasonal plants. I agree about the colors, although I did see some with six or seven colors that were amazing. I'm not skilled enough to try that--yet! Ha! Have a great weekend! 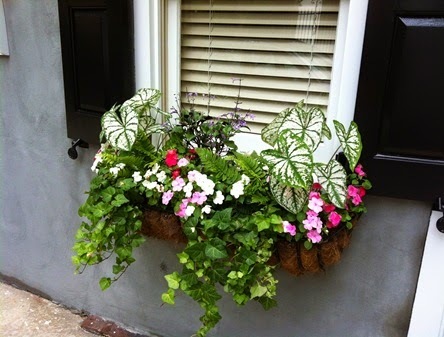 I was in Charleston recently and smitten with the flower boxes too. Yours is beautiful! Thank you, Jen. Charleston flower boxes are truly over the top in the best way! Love this post. I imagine you will find the perfect flower box mix, over time, and then mix it up again just for fun. Thanks, Lisa. The shade makes it challenging and keeps it interesting. Patience. and some Bacopa, like La Contessa said, or Margarita ornamental sweet potato is a great trailer, too. I'm told the Bacopa can't take the heat here in SC, but I would like to try the sweet potato vine. It's very popular in these parts, so my favorite nursery has had a hard time keeping it in stock. As for patience, I'm working on that, too. Thanks so much for stopping by! Welcome to FITH and thanks for joining in. I think you choices are charming. You could always sprinkle some alyssum seeds along the edge for a bit of white froth and spillage. I'm going to stay in touch so I can chart progress. Hi Jane, thanks so much for letting my outside flowers be "in the house" and thanks for stopping by and commenting. Plant people are always the nicest! I will definitely post an update in a couple of weeks. I think alyssum is a great idea. What a lovely box! Give it some time and some water and it should be fine ... and if not, you have to start somewhere! Good advice. I'll post an update in a few weeks! Thanks so much for stopping by. 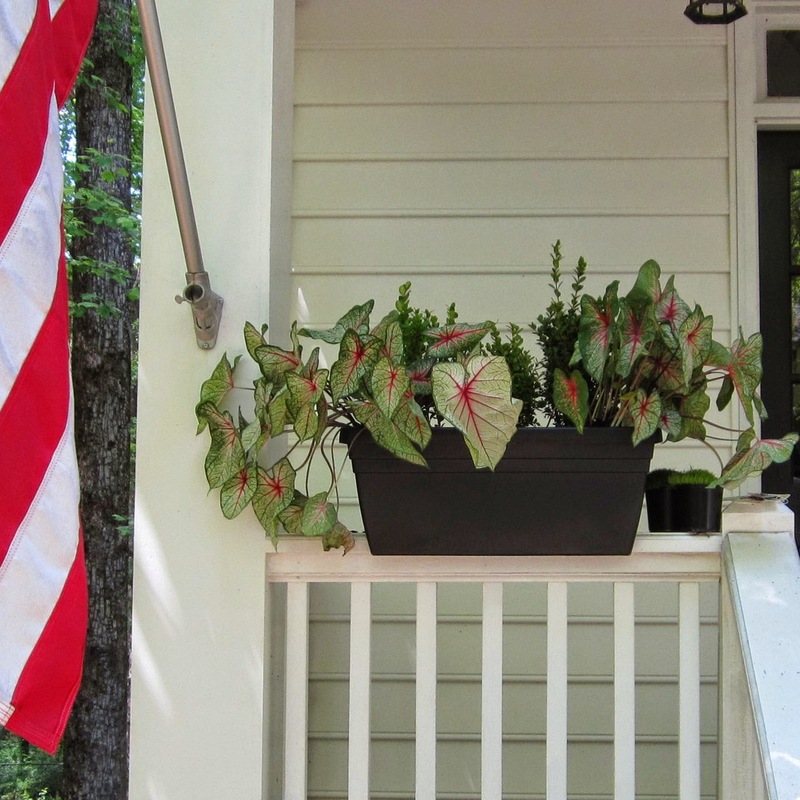 The bright pink in the caladium is just fabulous. Bravo! Thanks, Denise. I do love caladiums; they are so hardy in hot weather. wow! Here in Spain people only plant pelargonium, they are colorful but a little boring. Thanks so much. I can't imagine anything in Spain would be boring! I would love to visit someday! Thanks for stopping by.